Hey… Today was a crappy kinda day for many reasons. That is all. I live in hope for tomorrow! 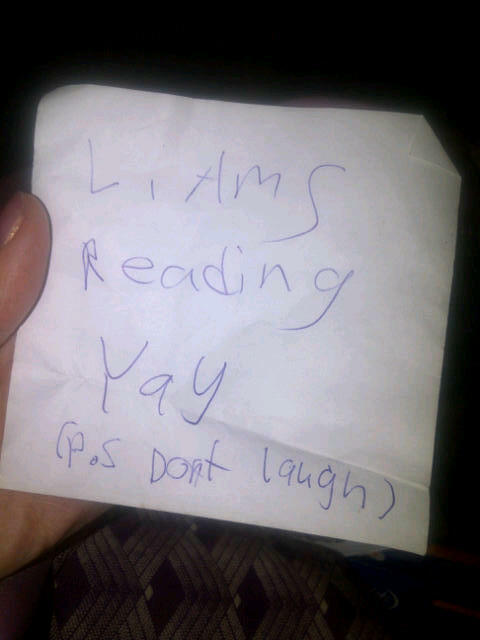 28 January 2011 ~ The picture is a note I found from Victoria regarding Liam in my bag when I was cleaning it….. You would be correct in assuming reading is not something we see Liam do often! Posted with WordPress for BlackBerry by WεηchƔ from the second cloud on your left . Am getting tired of them.